Subhradip Mandal from Calcutta, B.Com Graduate. 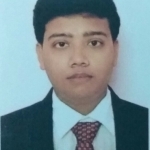 Subhradip Mandal is FINANCE and currently have no work experience. MS OFFFICE BANKING & NON BANK.. TALL ERP9 GSTR INTERNET & EMAIL COM..
are one of expert skill area's of Subhradip Mandal . Subhradip Mandal is working in Finance industry.